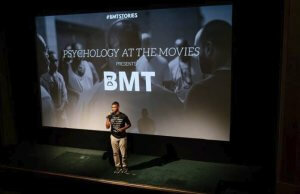 “This is a ther­apy ses­sion in of itself” said BMT founder, Alain ‘Fusion’ Clapham, aptly describ­ing the film screen­ing and dis­cus­sions hos­ted by Psy­cho­logy at the Movies in con­junc­tion with BMT. 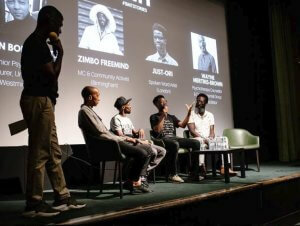 On Thursday 19th July, BMT and Psy­cho­logy at the Movies joined forces to under­take the big task of explor­ing tox­ic mas­culin­ity and emo­tion­al vul­ner­ab­il­ity among­st Black men. Psy­cho­logy at the Movies meets monthly to host in-depth dis­cus­sions on the them­at­ic ele­ments of films. Pre­vi­ous films have included Fight Club and The Usu­al Sus­pects. BMT, which stands for Black Man Time, is part of Industry in The Streets, a cre­at­ive youth agency that devel­ops pro­jects that aim to improve the qual­ity of life for young people. 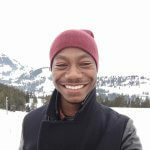 BMT spe­cific­ally focuses on the Black Brit­ish com­munity. Held at Regent Street Cinema, BMT and Psy­cho­logy at The Movies screened the award-win­ning film ‘The Work’, a doc­u­ment­ary filmed inside Fol­som State Pris­on which fol­lows a four-day group ther­apy ses­sion between pris­on­ers and volun­teers from the out­side world. Poets Just-Ori and Broken Pen per­formed spoken word per­form­ances which were then fol­lowed by pan­el dis­cus­sions fea­tur­ing Uni­ver­sity of West­min­ster psy­cho­logy lec­turer Bry­an Bona­parte, rap­per and act­iv­ist Zim­bo Free­m­ind, and psy­cho­ther­apy coun­sel­lor Wayne Mertins-Brown. Dis­cus­sions around tox­ic mas­culin­ity and men­tal health issues are wel­come, because for many of us who grew up before the 2010s, nuanced and sym­path­et­ic exam­in­a­tions of men­tal health in the Black com­munity were absent. I still can remem­ber the furore that arose after The Sun cruelly splashed on their front page “Bonkers Bruno Locked Up”, after box­er Frank Bruno was admit­ted into a psy­chi­at­ric hos­pit­al. If it wasn’t treated as a pri­or­ity, it was met with ridicule or apathy. Again­st this back­drop, it’s hard not to view this event as being any­thing oth­er than an exer­cise in cath­arsis. 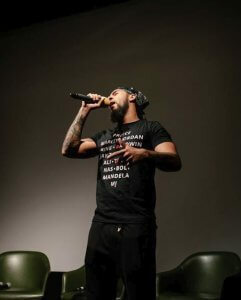 The event kicked off with fant­ast­ic spoken word per­form­ances from Just-Ori and Fusion, which centred on per­son­al reflec­tions on their indi­vidu­al hard­ships and anxi­et­ies. Both poets gave very enga­ging pieces, filled with bril­liant word­play, per­fectly high­light­ing the role tox­ic mas­culin­ity has played in cre­at­ing self-destruct­ive tend­en­cies. Poet and rap­per Broken Pen closed the night with an emphat­ic and tre­mend­ous piece. Hear­ing such per­son­al stor­ies of their struggles to cope with intern­al demons, was a per­fect segue into the screen­ing of The Work. In The Work all the pris­on­ers are serving lengthy sen­tences due to extremely viol­ent pasts. One pris­on­er, before his incar­cer­a­tion, attemp­ted to lit­er­ally saw a man in half with a knife. Another was a ‘shot caller’ for the Bloods gang. But The Work elev­ates itself from merely being a sim­ple explor­a­tion of viol­ence. In fact, the doc­u­ment­ary doesn’t linger too much on their crimes. Instead the doc­u­ment­ary digs deep­er into the role per­son­al trau­ma played in lead­ing them towards a destruct­ive path. Not­ably, unstable rela­tion­ships with fath­ers are men­tioned quite a few times as a cata­lyst for trau­ma. In their jour­ney towards redemp­tion and rehab­il­it­a­tion, the film is filled with scenes of men cry­ing, men hold­ing each oth­er in their arms and listen­ing to their stor­ies of pain. By delving into their trau­ma and depict­ing their attempts at redemp­tion, the doc­u­ment­ary achieves a spec­tac­u­lar human­isa­tion of these pris­on­ers. It doesn’t ask you to for­get their crimes, but it does ask you to see them as hurt men, who not only could have been some­thing great­er with the right guid­ance, but con­versely still have hope at achiev­ing some peace. The film is bril­liant, intense, and raw, with some scenes leav­ing the audi­ence doubled over in laugher and oth­ers bring­ing many people to tears. I can safely say, it’s one of the most mag­ni­fi­cent doc­u­ment­ar­ies I’ve seen, and I’m glad BMT and Psy­cho­logy at the Movies gave every­one the chance to view it. The bril­liance of The Work and its depic­tion of ther­apy as a mech­an­ism for heal­ing had a lot of res­on­ance across the pond to the Regent Street cinema. To reit­er­ate, the whole event was described as a “ther­apy ses­sion in of itself” and the pan­el dis­cus­sion after­wards almost doubled up as one. People went bey­ond ask­ing ques­tions about the cine­mat­ic facets of the film and extra­pol­ated the film into their own lives, using The Work as a spring­board for ana­lys­ing the tox­icity of mis­guided mas­culin­ity among­st many Black men. Coun­sel­lor Wayne Mertins-Brown made an essen­tial cru­cial point to take away. He stressed the need for at risk Black men to go through coun­selling or ther­apy as early as pos­sible, before they flirt with dis­aster. If any­thing, hope­fully this screen­ing will inspire people to seek help when neces­sary and to sup­port and acknow­ledge one another’s men­tal health.